Procurement fraud comes in many forms and types. Recent front-page news stories can involve multi-million dollar frauds managed at the P&L level by suppliers, such as Pfizer’s recent complex overbilling scheme with the NHS. But procurement and payables fraud most often takes place on a smaller level, with varying degrees of sophistication. Oversight Systems provides an analytics managed service (and front-end software) capability for procurement and finance organizations to fight procurement fraud, whether perpetrated by suppliers, internal participants or both. It also provides similar capabilities to monitor for regulatory compliance (e.g., FCPA violations) as well as detect overpayment errors. Its solution is a complement to procure-to-pay (P2P), travel and expense (T&E) and various audit recovery solutions and approaches in the market today. This third and final installment of this Spend Matters Vendor Snapshot covering Oversight Systems provides an objective SWOT analysis of the provider and offers a competitive segmentation analysis and comparison. It also includes recommended shortlist candidates as alternative vendors to Oversight Systems and provider selection guidance. Finally, it provides summary analysis and recommendations for companies that can best take advantage of Oversight Systems’ capabilities. 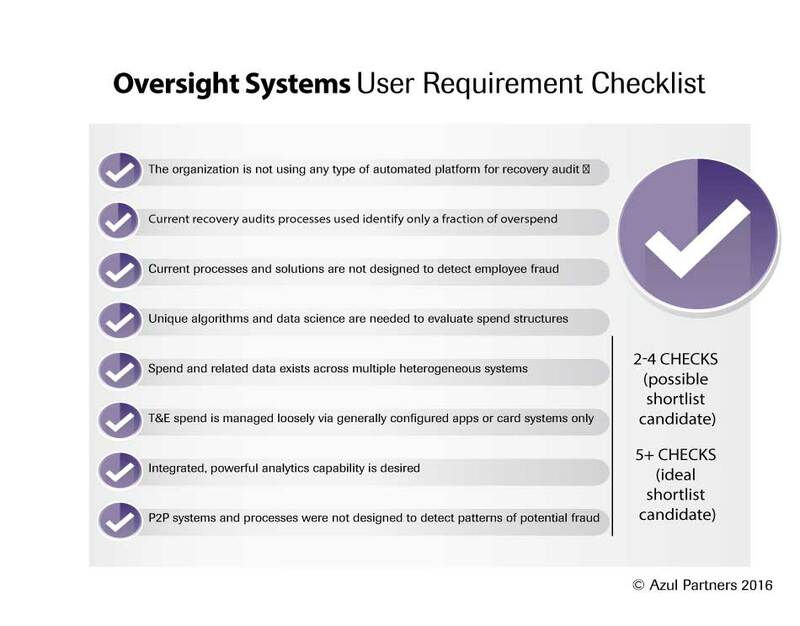 Part 1 of this series provided an in-depth look at Oversight as a firm and its specific solutions, and Part 2 gave a detailed analysis of solution strengths and weaknesses and a review of the solution’s user experience. Oversight has a number of “substitute” competitive segments and competitors but fewer providers that compete directly against it. Audit recovery specialists. Providers in this segment of the market include PRGX, Apex Analytix and Cotiviti. While historically services-driven, these firms are (generally) making significant investments in software, especially in the forensic, supplier management and analytics areas. See our recent analysis of this sector: Exploring the Future of the Recovery Audit Market: Reading the PRGX and Lavante Tea Leaves. Spend analytics. While typically using invoice, ERP, procurement and card source systems to drive sourcing strategy and procurement compliance/savings, these providers are starting to take greater advantage of their data collection efforts to detect overpayment and related opportunities. 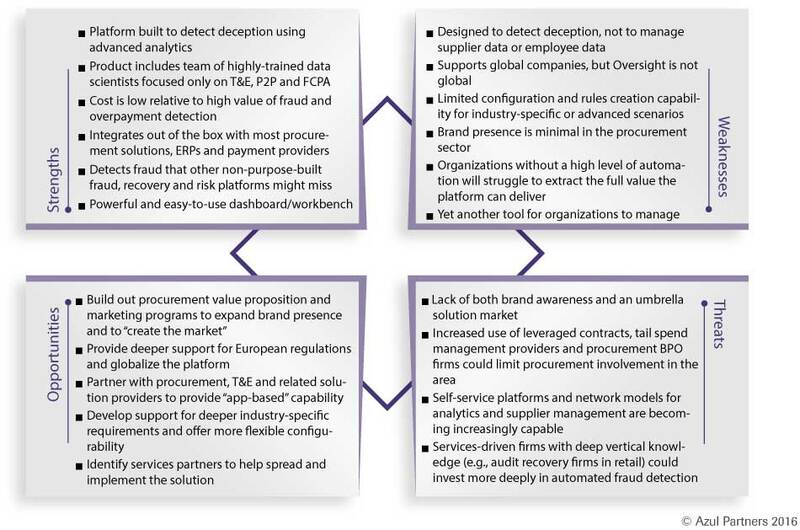 While they have not yet branched out into fraud detection (based on our existing research and knowledge of the market), the combination of increasingly powerful machine learning and AI capabilities beyond deployed by some of these providers (e.g., TAMR, Spend 360) and expanding value propositions into supply and finance (e.g., AP / treasury) suggest entering this market more directly is materially plausible. Supplier Network. While not current direct competitors in the fraud area, supplier network providers such as SAP Ariba, Tungsten, Taulia and Tradeshift could increasingly build fraud and overpayment detection into their network offerings. PRGX, which Spend Matters estimates is the largest audit recovery firm by billings, stores an estimated $1.2 trillion in client spend data in their environment and recovers over $1 billion annually (a 1% recovery rate) for clients. PRGX uses a variety of internal analytics and forensic technologies for overpayment, credit and fraud detection. It has deep expertise in retail and grocery environments. PRGX is a substitute for Oversight Systems in certain cases (but is not a full replacement). and PRGX Acquires Lavante: PRGX Analysis and Customer Recommendations), was arguably the first provider in the audit recovery sector to focus on the commercialization of technology and the delivery of solutions into client hands versus process and software management by the audit recovery firm. While auditors, including those at its new “home,” may dismiss current self-service approaches that use a vendor file master and line-level invoice-based model for anything but the most basic recovery scenarios as unreliable and insufficiently capable, they will only improve over time. And in Lavante’s case, while the provider started out focused on the identification of overpayments, duplicate payments and potentially fraudulent payments, it has evolved to offer supplier information management (SIM) functionality and supplier master management capability. This solution now extends to contracts, purchase order and invoice management data to enable deep auditing geared towards overpayment, duplicate payment and fraudulent payment prevention rather than post-payment detection where recovery efforts that are always only partially successful have to come into play. Apex Analytix provides a broad range of recovery audit and analytics capabilities, which includes software solutions that comprise of invoice automation (which can detect over billings and duplicate billings), overpayment prevention (which can detect potential overbillings or duplicate billings before a payment is made), fraud detection (for unmatched invoices or payments) and specialty solutions for retail auditing. Like PRGX, Apex brings both vertical expertise, a solutions orientation and increasing technology capability to the audit recovery area. Fiscal Technologies, which provides an AP Forensics Enterprise Suite. The solution integrates a set of forensic tools to detect and reduce overpayments, detect potential fraud and monitor AP transactions on a regular basis. It also includes a tax verification module to pinpoint VAT irregularities in both header and line items to increase compliance with tax rules and regulations. Kirix ProfitPoint, a solution that includes a data analysis platform for exploring and researching identified overpayment errors that can result from pricing errors, over-billings, duplicate payments and even fraud if no matches to a payment can be found. Technology Insight DataShark, which runs on top of an organization's ERP system to identify overpayments and duplicate payments by identifying erroneous records in the ERP through a more intelligent match between invoices and payment (requests). There are also industry-specific competitors as well. One example is Gold Prairie, which provides software for the immediate identification of payment errors that can identify overpayments, duplicate payments and pricing errors that is specially designed for the retail and grocery industry. Unlike less specialized P2P, T&E, audit recovery solutions and services-based approaches to combatting overpayments and fraud, Oversight Systems has devoted its entire 10+ years of development — and tens of millions of dollars of investment — to developing solutions that target errors, waste, misuse and fraud in the grey area of enterprise spend. The largest challenge with Oversight Systems has nothing to do with its approach or capability. Rather, procurement and finance organizations have not prioritized and emphasized the deployment and use of these solutions like other classes of e-procurement, AP automation, analytics and treasury management solutions. Spend Matters believes that Oversight Systems and those offering similar capabilities bring an integrated set of technologies and analytics managed service that procurement is missing, even if it doesn't realize it. Even though it sounds like it is AP's job to monitor payments, the task is impossible to fully accomplish without automation. Consider how invoices are often queued for approval into a P2P workflow involving multiple parties and documents (or flagged for manual review). And if the invoice and match pass tolerances, it is likely to be approved anyway, and anyone deliberately committing fraud is likely to be aware of these vulnerabilities. More broadly, with the 80/20 rule in full deployment in most organizations from an analytics perspective, it is easy for procurement and finance to miss billings for undelivered services, unapproved expenses and other types of overspend that slip through the cracks. Until it can help define a class of solutions that are a “must have” by themselves, Oversight Systems deserves a place on any P2P, T&E or spend analytics shortlist as a “bolt on” capability for evaluation. In fact, deploying Oversight could likely fully offset the costs of the solution(s) it is being used alongside of, not to mention help keep organizations on the right side off FCPA and other regulatory compliance issues involving payments and expenditure.